Here is a link to my friend Alison’s latest blog post. She tells all about making baby food! It’s a GREAT way to save money on feeding your little ones. Alison provides step by step instructions with photos! I’ll be honest–I never made my kids baby food. I just wasn’t into being frugal when they were babies and honestly I just didn’t have the time. And I don’t remember them eating that much baby food anyway–we just gave them table food and mashed it up really well! Although I didn’t make baby food I did make my own baby wipes! It’s easy and saves a lot of money! Take a roll of sturdy (but soft!) paper towels and cut them in half. I like to use the Bounty ones that are plain white. I use my electric knife to cut it and it works like a charm. Remove the inner cardboard and place roll in a plastic container. I found some containers at Family Dollar that were the perfect size and I have also used old wipe containers. The round containers are of course much easier. Take 2 cups water, 2 tablespoons baby lotion, 2 tablespoons baby wash, and 1 tbsp baby oil and bring to a boil. Pour over cut paper towels and allow to cool. 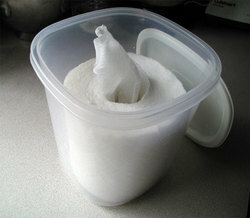 The liquid will seep down into the container and will saturate all the paper towels. I like using Johnson and Johnson’s lavender baby wash and lotion–it makes very nice smelling wipes!